Ultimately it will be the jury of seven men and five women who decide where the truth lies. One member of the prosecution camp, when asked Friday about the boisterous and clearly optimistic buzz coming from the defense quarter, quipped, "They're like Romney Republicans the night before the election." In this case, twelve votes will decide. The jury is not expected to get the case until Tuesday. Two more closing arguments are set for Monday when the trial resumes. Edwin Jacobs Jr., the lawyer for Ligambi, will get a little more than two hours to wrap up the defense arguments. Then the prosecution will have a chance at a rebuttal. U.S. District Court Judge Eduardo Robreno will explain the laws that apply Tuesday morning. That so-called jury charge is expected to take at least two hours, setting the stage for the start of deliberations. Ligambi, 73, and his co-defendants are charged with racketeering conspiracy built around allegations of bookmaking, loansharking, extortion and the distribution of illegal video poker machines. The defense has argued since the trial opened in mid October that the charges are in fact a series of unrelated events that have nothing to do with a broad, mob-connected criminal conspiracy. They have also challenged the credibility to key government witnesses and the prosecution's interpretation of events. Warren, for example, hammered away at the government's contention that a meeting at LaGrigilia, a North Jersey restaurant in May 2010 that was set up by his client was a mob sitdown between leaders of the Gambino crime family from New York and Ligambi and several of his top associates. In fact, Warren said, it was a "social" gathering of "geiatric gangsters" who sat around for five hours eating, drinking and talking about old times. Nothing that was discussed at that lucheon, which was secretly recorded by a mob informant wearing a body wire, had anything to do with the charges in the pending case. Warren also showed the jury a photo of a private conference room at the restaurant where the luncheon could have taken place. But he noted that the manager of the restaurant, called as a defense witness, said Licata and the others opted not to have their meal in a private room, but rather in the main dining room. The session was not, as the government claimed, a "meeting of the board of directors of organized crime," but rather "a bunch of old guys eating and drinking." "It is an insult to your intelligence," he told the jury, for the government to argue otherwise. Gregory Pagano, the lawyer for Anthony Staino, jumped on that same theme, telling the jury that the prosecution throughout the trial was "hiding, distorting and mischaracterizing evidence." He said evidence, testimony and the govenment's own tapes support his claim that $25,000 Staino gave to an undercover FBI agent posing as a corrupt financier, was "an investment" and not, as the prosecution alleged, a loanshark transaction. "It's not fair....It's not justice...It's not the truth," Pagano said of other allegations that he contended were not supported by the evidence. The jury also heard from lawyers for co-defendants Gary Battaglini, Damion Canalichio and George Borgesi. All three ripped the prosecution case. Paul Hetznecker, Borgesi's court-appointed attorney, finished the day-long onslaught with an impassioned plea, arguing in part that his client was a defendant not because of anything he had done, but because of who he is. 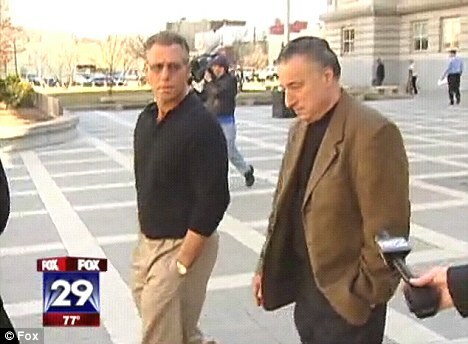 Borgesi, 49, was a top associate of mob boss Joseph "Skinny Joey" Merlino and was convicted with Merlino and five others in a different racketeering case in the same federal courthouse in 2001. The volatile mobster, who is Ligambi's nephew, has been in prison since 2000 and was about to be released when he was indicted in May 2011 in the current case. "They don't like my client and they don't want him out of jail," Hetznecker said. The entire case against Borgesi, he said, was built around the fabricated testimony of mob associate Louis "Bent Finger Lou" Monacello. Monacello, 46, testified for the prosecution, telling the jury that he ran Borgesi's bookmaking and loansharking operation after Borgesi was jailed. Monacello talked of beatings, extortions and loansharking and gambling operations that generated tens of thousands of dollars and said he operated on behalf of Borgesi and under the umbrella of the Ligambi organization. Hetznecker said Monacello used Borgesi's name and Ligambi's connection to run his own criminal enterpirse. And that he then parlayed their names and allegations about them into a deal with the government, winning own release from prison after he was indicted with the other defendants in the case in 2011. "He gave them what they wanted," Hetznecker said, arguing that the prosecution never bothered to try to substantiate or corroborate anything Monacello told them. He said the case was built around an overreaching investigation that tried to take unrelated facts and outright lies and turn them into an indictment. "They've completely mischaracterized the evidence in this case," he said. "The way they twisted and distorted the evidence is just outrageous." Not unexpectedly, the defense attorney arguments were praised by friends and family members. "You finally gonna write the truth?" one of Ligambi's sons asked a reporter. But what's been written about this case is really not the issue. What matters is what the jury believes. The answer to that may come some time next week. Until then, the smart money says keep those martini glasses on ice.